Havards Blackmoor Blog: More lost Age of the Wolf art! More lost Age of the Wolf art! Last month, I shared a painting that artist Lee Smith was comissioned to do for the now abandoned Age of the Wolf line for Blackmoor. Here's more! "A Character class illustration for a project that was cancelled. This guy is an inventor, able to piece together artefacts or powerful weapons from various components. I like to think of him as a 'fantasy MacGyver' "
The inventor class first appeared in Blackmoor Clock & Steam and it has long been known that it would be converted to 4E in the Age of the Wolf sourcebook. This further suggests that the rise of technology was going to be a prominent theme in this Blackmoor subsetting. 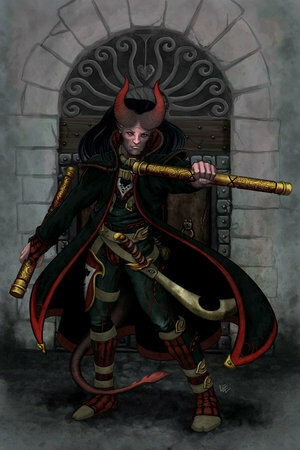 A character illustration for a cancelled project, this is a Tiefling Relic Hunter. He is employed to track down arcane artefacts. Not all fans will be happy to see Tieflings in Blackmoor. 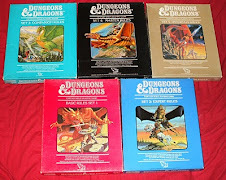 The Blackmoor: First Campaign Sourcebook (4E) introduced this 4E core race. The race description in that book did hint that this race would become more important in the future, so having them appear in AoW is no big surprise. 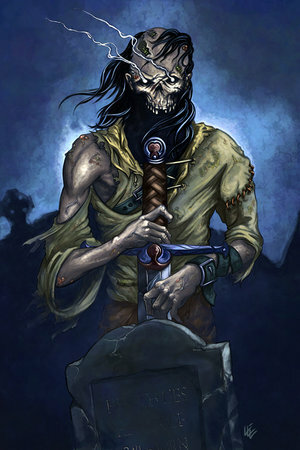 Illustration from a cancelled project, this is a type of undead that are animated not by the will of power-hungry necromancers, nor by the tragedy of their death, but by a force called arcane pollution -- their souls killed by wanton use of arcane magic, and then returned to animation by the same forces. This last one is perhaps the most interesting painting. The concept of arcane pollution and the idea that this can create undead is pretty fascinating. This is perhaps the explanation for the legion of undead following the Herald of Thanatos? I like all of these paintings. They are very well done, and its hard to pick a favorite. I would like to thank Lee for sharing them with us! Dark Dungeons RPG -First Draft available! Dragons at Dawn RPG released! The Last Fantasy Campaign: Uther Lives! An Easter Egg.... of Coot?